(CNN) -- Antiguan and Barbudan regulators Friday took control of U.S.financier Robert Allen Stanford's financial institutions on the twin-island nation, a day after federal agents served the Texas businessman with papers accusing him of running an investment fraud scheme. 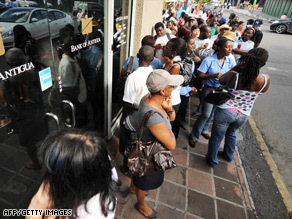 Customers queue outside the Stanford Group-owned Bank of Antigua in St. John's. The Financial Services Regulatory Commission of Antigua and Barbuda appointed receivers to manage Stanford International Bank Ltd. and Stanford Trust Company Ltd., the commission said in a statement. The receivers, Nigel Hamilton-Smith and Peter Wastell of Britain-based Vantis Business Recovery Services, are in Antigua with other recovery specialists to take control of the entities, the commission said. On Thursday, the FBI announced federal agents found Stanford in Fredericksburg, Virginia, and served him with papers accusing him and three of his companies of orchestrating a $9.2 billion investment fraud scheme. He has no criminal charges against him, and he was not taken into custody, FBI spokesman Richard Kolko said. The FBI won't talk about a criminal investigation of Stanford's activities, but federal law enforcement officials familiar with the case leave no doubt that federal agents are investigating his financial dealings. But multiple officials indicated criminal charges are not imminent and would not discuss potential charges. Stanford has arranged to give his passport to one of his attorneys, who will offer it to federal authorities. In a complaint filed Tuesday in federal court in Dallas, Texas, the Securities and Exchange Commission accused Stanford International Bank of using a network of financial advisers to sell about $8 billion of "certificates of deposit" to investors. The bank boasted it had a unique investment strategy that had allowed it to reap double-digit returns on its investments for the previous 15 years, the SEC said. The civil complaint alleged an additional scheme relating to $1.2 billion in sales. The Antigua-based bank claims its network has $51 billion in deposits and assets under management or advisement, with more than 70,000 clients in 140 countries. The allegations against Stanford and his companies have sparked runs on Stanford banks in Antigua and in Venezuela, where the government took over the local subsidiary after it recorded "extraordinary" withdrawals Tuesday and Wednesday, said Edgar Hernandez Behrens, Venezuela's superintendent of banks. The SEC complaint also named James Davis, SIB's chief financial officer; Laura Pendergest-Holt, chief investment officer of Stanford Financial Group; and investment adviser Stanford Capital Management. Meanwhile, Colombia's stock market and bank watchdog said Friday Colombians who invested in the Bogota stock market through Stanford's Colombian brokerage arm, Stanford Bolsa y Banca SA, run no risk of losing their funds. A Financial Services Superintendency spokeswoman told CNN that Stanford Bolsa y Banca managed three Bogota mutual funds worth a total of about $27 million (70 billion Colombian pesos) at current stock and currency market rates, together with individual client portfolios of around $98 million (250 billion Colombian pesos). She said extraordinary shareholder meetings had been called to decide whether the three mutual funds would be transferred to the management of another brokerage or would be liquidated. Individual clients have begun the process of transferring management of their portfolios to other brokerages, the Financial Services Superintendency spokeswoman said. Colombians were never able to deposit funds directly in Colombia with Stanford's international banking arm. CNN repeatedly tried calling the manager of Stanford Bolsa y Banca, but he declined to answer calls. In London, the England and Wales Cricket Board said it has terminated all contractual links with Stanford.